Received July 4, 2018; Revised July 27, 2018; Accepted July 27, 2018. Red blood cell (RBC) transfusion is an essential practice during surgery to accommodate for bleeding. As such, there are efforts being made to allow for a safe and appropriate transfusion due to shortages of blood components and to minimize transfusion-related adverse reactions. However, a conventional transfusion decision with relatively high hemoglobin (Hb) threshold is still performed in clinical setting. In this study, we investigated the threshold of Hblevel and appropriateness of RBC transfusion in patients receiving perioperative RBC transfusion in surgical departments. We investigated the pre-transfusion Hb level of 1,379 patients (2,170 episodes) receiving perioperative RBC transfusion in five surgical departments, including cardiothoracic surgery (CS), general surgery (GS), neurosurgery (NS), obstetrics and gynecology (OBGY), and orthopedics (OS), between June 2017 and March 2018. The appropriateness of transfusion was evaluated with two criteria: 1) pretransfusion Hb level ≤10 g/dL and 2) posttransfusion Hb level ≤10 g/dL. The median pretransfusion Hb level was 8.5 g/dL (interquartile range 7.7∼9.4); that of each department was as follows: 8.6 g/dL (7.9∼9.2) in CS, 7.9 g/dL (7.3∼8.6) in GS, 9.1 g/dL (8.5∼9.8) in NS, 8.5 g/dL (7.7∼9.8) in OBGY, and 8.7 g/dL (7.9∼9.7) in OS. With a criteria of pretransfusion of Hb level ≤10 g/dL, 85.4% of total episodes were appropriate. With criteria of post-transfusion of Hb level ≤10 g/dL, 44.7% were appropriate. This study presents a fundamental data observing the trend of RBC transfusion in a single institution. A significant proportion of inappropriate RBC transfusion are still being conducted in surgical setting. Continuous and effective education of clinicians and implementation of monitoring systems to assess the appropriateness of RBC transfusion may be necessary. Over the past decades, patients were transfused when their hemoglobin (Hb) level fell below 10 g/dL or hematocrit level fell below 30% . This ‘10/30’ transfusion trigger rule, proposed back in 1942, has been widely adopted. A recently proposed restrictive transfusion strategy (Hb 7∼8 g/dL) appears to show even better outcome compared with the conventional transfusion strategy [2,3]. Patient blood management, an evidence-based approach to improve patient’s outcome and utilize limited resources of blood components effectively, is being implemented worldwide. Although many guidelines now suggest a lower Hb level threshold for red blood cell (RBC) transfusion , the ‘10/30’ rule still appears to be practiced habitually. As such, it has recently been of great interest to many clinicians to determine the appropriateness of RBC transfusion. There are several ways to evaluate the appropriateness of RBC transfusion. Metrics, such as pretransfusion hemoglobin trigger, proportion of posttransfusion Hb levels, proportion of RBCs administered as single-transfusions, and RBCs/100 acute inpatient days, are simple to obtain; however, Spadbrow et al. suggested that those are not as accurate as assessing the appropriateness of RBC transfusion through medical chart review. However, assessing the appropriateness of RBC transfusion through medical chart review is too labor-intensive. Besides, with regard to perioperative patients, retrospective medical chart review does not seem to be sufficient due to inadequate documentation . In this respect, indirect evaluation using simple metrics was applied to determine the appropriateness of RBC transfusion in the present study. We aimed to observe the Hb threshold in perioperative transfusion and assess the appropriateness of perioperative RBC transfusion among five surgical departments. A total of 1,379 patients who received perioperative RBC transfusion in five surgical departments between June 2017 and March 2018 in Seoul St. Mary’s Hospital, the Catholic University, were included. The five departments included were cardiothoracic surgery (CS), general surgery (GS), neurosurgery (NS), obstetrics and gynecology (OBGY), and orthopedics (OS). This study was approved by the institutional review board of Catholic Medical Center. The data of pre- and post-transfusion Hb levels, units of RBC products transfused, and time of transfusion were obtained. The pretransfusion Hb level was defined as the lowest Hb level within 24 hours before transfusion. The post-transfusion Hb level was the first Hb level measured after transfusion. Serial transfusion of multiple units given to the same patient in a day without measurement of Hb level was considered as one episode of transfusion. The Korean society of Blood Transfusion recommends a Hb level of 10 g/dL for intraoperative RBC transfusion in patients with cardiac disease or cerebrovascular disease. Accordingly, the appropriateness of transfusion was evaluated with two different criteria based on the guideline: 1) pretransfusion Hb level ≤10 g/dL and 2) posttransfusion Hb level ≤10 g/dL. Continuous data are summarized using the mean and standard deviation, or median and interquartile range (IQR), as appropriate. Comparison was evaluated using ANOVA for continuous data and Pearson’s chi-square test for categorical variables. All analyses were conducted using SPSS software (Version 24.0, Armonk. NY, USA). A P value of less than 0.05 was considered statistically significant. A total of 2,170 episodes with 5,250 units of RBC components were included. The median number of units transfused per person was 2 units (IQR, 1∼2). The proportion of single unit transfused was 710 episodes (32.7%) of total episodes. Demographic features are listed in Table 1. The median age of patients was 62.0 years, and 40.8% was male. The highest frequency of transfusion episode was observed in GS (705 episodes, 32.5%) and lowest in OBGY (216 episodes, 10.0%). The distribution of pretransfusion Hb level in total patients is shown in Fig. 1A. The Hb level range of 8.1∼9.0 g/dL was the most frequent level for transfusion decision. About 14.6% of patients had a Hb level of >10 g/dL, which appears to be an inappropriate transfusion decision. The Hb level after transfusion was distributed, as seen in Fig. 1B. Among the total study population, 55.3% had a post-transfusion Hb level of >10 g/dL. The median (IQR) pretransfusion Hb level was 8.5 g/dL (7.7∼9.4) among all patients. The median (IQR) pretransfusion Hb level of each department was as follows (Fig. 2): 8.6 g/dL (7.9∼9.2) in CS, 7.9 g/dL (7.3∼8.6) in GS, 9.1 g/dL (8.5∼9.8) in NS, 8.5 g/dL (7.7∼9.8) in OBGY, and 8.7 g/dL (7.9∼9.7) in OS. GS and NS showed the lowest and the highest pretransfusion Hb level, respectively (P value <0.001). The Proportion of appropriate transfusion is seen in Fig. 3. The criteria of pretransfusion Hb level ≤10 g/dL showed a higher proportion of appropriateness compared with the criteria of post-transfusion Hb level ≤10 g/dL. 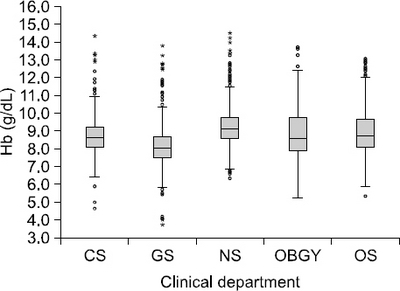 GS showed highest proportion of appropriateness, while OS showed the lowest with statistical significance (P<0.001). In regard to the time of transfusion, pre-operation day (pre-OP), operation day (OP), and post-operation day (post-OP) comprised 13.8% (301 episodes), 28.0% (606 episodes) and 58.2% (1,263 episodes) of total episodes of transfusion, respectively. The proportion of inappropriate transfusion to appropriate transfusion was highest in the OP group (Fig. 4). 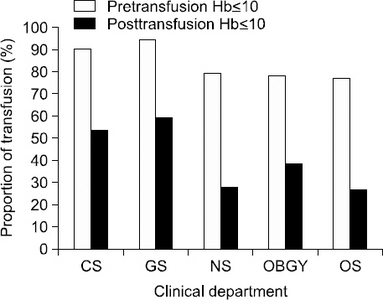 In the OP group, there were twice as many inappropriate transfusions (418 episodes) than appropriate transfusions (188 episodes) with a criteria of posttransfusion Hb ≤10 g/dL (Fig. 4B). When comparing the pre-transfusion Hb level between the different clinical departments according to the perioperative period, the Hb level was highest in the OP group in every clinical department (Table 2). In terms of appropriateness by clinical departments according to the time of transfusion, OS and NS showed inappropriate transfusion episodes by more than double that of appropriate transfusion during OP (OS: 125 episodes, 82.8%, NS: 102 episodes, 76.7%) and post-OP (OS: 227 episodes, 69.4%, NS: 170 episodes, 69.1%) with the criteria of post-transfusion Hb level (P<0.001). Abbreviations: CS, cardiothoracic surgery; GS, general surgery; NS, neurosurgery; OBGY, obstetrics and gynecology; OS, orthopedics. Distribution of pretransfusion Hb level (A) and posttransfusion Hb level (B) in total patients. Distribution of pretransfusion Hb level in five surgical departments. Proportion of appropriate transfusion with two criteria in five surgical departments. Proportion of appropriate and inappropriate transfusion with criteria of pretransfusion Hb (A) and posttransfusion Hb (B) according to perioperative period. Comparison among three groups using ANOVA. Abbreviations: Hb, hemoglobin; pre-OP, pre-operation day; OP, operation day; post-OP, post-operation day; CS, cardiothoracic surgery; GS, general surgery; NS, neurosurgery; OBGY, obstetrics and gynecology; OS, orthopedics. According to previously reported studies [7,8], the rates of inappropriate RBC transfusion in surgical patients ranged from 25% and 74%, similar to our findings in this study. This huge difference is likely attributed to the decision of the appropriate transfusion . Indeed, in this study, the inappropriateness rate was 55.3% with the criteria of post-transfusion Hb >10 g/dL, while it was 14.6% with pre-transfusion Hb >10 g/dL. It also depends on whether it is a medical or surgical setting. Assessing the appropriateness of RBC transfusion in surgical patients is especially complex due to the amount of potential blood loss. However, it is almost impossible to measure the exact amount of perioperative blood loss and reflect it in the calculation of blood loss and gain. Subsequently, indirect evaluation should be applied when assessing the appropriateness of RBC transfusion in surgical patients. In other studies, hematocrit <33% in discharge , posttransfusion Hb level <8 g="" dl="" or="" 10="" g="" dl="" span="" class="xref">7] were used as criteria dealing with surgical patients. Spradbrow et al. suggested that a chart audit of 50 RBC transfusions with adjudication using robust criteria is the optimal means to evaluate RBC transfusion appropriateness at an institution for benchmarking and quality-improvement initiatives. Further study would be needed to determine whether it is applicable in surgical setting. As Barr et al. suggested, the lack of guidance on the appropriate target range of post-transfusion Hb is likely to compound the variation in transfusion practice observed. The guidelines on the appropriate target range of posttransfusion Hb, as well as the creation of simple metrics that can be applied to surgical patients in assessing the appropriateness of RBC transfusion is required. Many studies are being published on the benefit of restrictive transfusion rather than liberal transfusion. Carson et al. analyzed 31 randomized clinical trials (RCT) and demonstrated that restrictive RBC transfusion threshold (Hb 7∼8 g/dL) was not associated with higher rates of adverse clinical outcomes and a restrictive transfusion threshold is safe in most clinical settings . In another RCT, liberal transfusion strategy, as compared with a restrictive strategy, did not reduce the mortality rates or inability to walk independently on 60-day follow-up or in-hospital morbidity in elderly patients at high cardiovascular risk. Villanueva et al. not only showed that restrictive transfusion was harmful, but that it had better outcome with lower mortality compared with liberal transfusion in patients with gastrointestinal bleeding. Even with these growing evidences of superiority of restrictive transfusion, clinicians seem to be still passive or reluctant to accept the new guidelines of transfusion, as evident in this study with a relatively high proportion of inappropriate transfusions. Effort for continuous education as well as implementation of effective auditing program should be necessary to minimize inappropriate transfusion. Tinmouth et al. showed in their systematic research, that behavioral interventions were effective in changing the transfusion practices of physician and reducing blood utilization. Another study also reported that engagement of physicians who prescribed inappropriate RBC resulted in a significant decline in RBC use without evidence of a change in mortality . Moreover, Yerrabothala et al. reported that substantial decrease in RBC utilization had been observed with the implementation of restrictive transfusion policy using prospective computerized order auditing. In this study, most episodes of transfusion were done during the post-operative period; however, the proportion of inappropriate to appropriate transfusion was higher during the operative period. Intraoperative transfusion could be reduced with several strategies, such as minimizing blood loss, autologous blood cell salvage, and improving tolerance of anemia . Patient positioning, use of tourniquet, and infusion of local vasoconstrictor can be used to limit the blood flow to the site of surgery. Methods for improving hemostasis at the site of bleeding include the use of electrocautery, argon-beam coagulation, and anti-fibrinolytic agents. OS and NS showed higher frequency of inappropriate transfusion during both operative and post-operative periods. This seems to be originated from the higher Hb level required for cerebrovascular patients and inherent nature of orthopedic surgery that retains post-operational heavy bleeding from bones. There are some limitations in this study. First, for the criteria of inappropriate transfusion, the pre- and post-transfusion Hb level >10 g/dL might be too generous, resulting in a small proportion of inappropriate transfusions. We set the criteria of inappropriate transfusion relatively wide because the Hb threshold of RBC transfusion for patients with cardiac disease or other comorbidities is 10 g/dL. Since a chart review of each patient to determine the underlying disease was not attained, we set the criteria wide enough to include patients regardless of different comorbidities. Second, the type of operation was not applied in determining the appropriateness of transfusion. Since the amount of bleeding and patient demography differ according to the types of operation, reflection of types of operation on the evaluation of appropriate transfusion should provide results with greater precision. This study provides fundamental data on the trend of RBC transfusion in a single institution. Significant proportion of inappropriate RBC transfusions was still conducted in surgical setting. Despite the lowered Hb threshold recommended in the current guidelines, practitioners seem to be unwilling or uncomfortable to adopt and accept the new guidelines. Continuous and effective education of clinicians and implementation of monitoring systems to assess the appropriateness of RBC transfusion may be necessary. Carson JL, Carless PA, and Hebert PC. Transfusion thresholds and other strategies for guiding allogeneic red blood cell transfusion. Cochrane Database Syst Rev 2012:CD002042. Carson JL, Guyatt G, Heddle NM, Grossman BJ, Cohn CS, and Fung MK et al. Clinical practice guidelines from the AABB:red blood cell transfusion thresholds and storage. JAMA 2016;316:2025-35. Villanueva C, Colomo A, Bosch A, Concepción M, Hernandez-Gea V, and Aracil C et al. Transfusion strategies for acute upper gastrointestinal bleeding. N Engl J Med 2013;368:11-21. Carson JL, Grossman BJ, Kleinman S, Tinmouth AT, Marques MB, and Fung MK et al. Red blood cell transfusion:a clinical practice guideline from the AABB*. Ann Intern Med 2012;157:49-58. Spradbrow J, Cohen R, Lin Y, Armali C, Collins A, and Cserti-Gazdewich C et al. Evaluating appropriate red blood cell transfusions:a quality audit at 10 Ontario hospitals to determine the optimal measure for assessing appropriateness. Transfusion 2016;56:2466-76. Audet AM, Goodnough LT, and Parvin CA. Evaluating the appropriateness of red blood cell transfusions:the limitations of retrospective medical record reviews. Int J Qual Health Care 1996;8:41-9. Park Y, Park Y, Lee Y, Baek EJ, Kim S, and Kim HO. Evaluating the appropriateness of a single unit transfusion. Korean J Blood Transfus 2007;18:177-87. Joy PJ, and Bennet SJ. The appropriateness of blood transfusion following primary total hip replacement. Ann R Coll Surg Engl 2012;94:201-3. Hasley PB, Lave JR, and Kapoor WN. The necessary and the unnecessary transfusion:a critical review of reported appropriateness rates and criteria for red cell transfusions. Transfusion 1994;34:110-5. Goodnough LT, Vizmeg K, Riddell J, and Soegiarso RW. Discharge haematocrit as clinical indicator for blood transfusion audit in surgery patients. Transfus Med 1994;4:35-44. Barr PJ, Donnelly M, Cardwell CR, Parker M, Morris K, and Bailie KE. The appropriateness of red blood cell use and the extent of overtransfusion:right decision?Right amount?. Transfusion 2011;51:1684-94. Carson JL, Terrin ML, Noveck H, Sanders DW, Chaitman BR, and Rhoads GG et al. Liberal or restrictive transfusion in high-risk patients after hip surgery. N Engl J Med 2011;365:2453-62. Tinmouth A, MacDougall L, Fergusson D, Amin M, Graham ID, and Hebert PC et al. Reducing the amount of blood transfused:A systematic review of behavioral interventions to change physicians’transfusion practices. Arch Intern Med 2005;165:845-52. Tavares MM, Diquattro PJ, and Sweeney JD. Reduction in red blood cell transfusion associated with engagement of the ordering physician. Transfusion 2014;54:2625-30. Yerrabothala S, Desrosiers KP, Szczepiorkowski ZM, and Dunbar NM. Significant reduction in red blood cell transfusions in a general hospital after successful implementation of a restrictive transfusion policy supported by prospective computerized order auditing. Transfusion 2014;54:2640-5. Shander A, Javidroozi M, Perelman S, Puzio T, and Lobel G. From bloodless surgery to patient blood management. Mt Sinai J Med 2012;79:56-65.